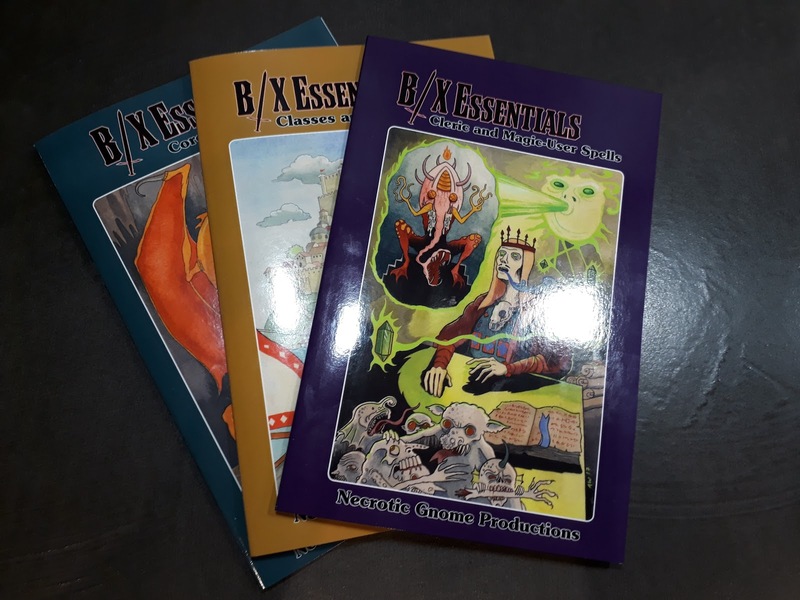 B/X Essentials: Cleric and Magic-User Spells: Out Now! I am proud to announce the publication of the third B/X Essentials book: Cleric and Magic-User Spells! A retelling of the classic Basic / Expert spells from 1981, presented in a swanky new format. All the cleric and magic-user spells in a slim 34-page booklet. Designed with one thing in mind: use at the table. No important mechanical info hidden away in blocks of text. 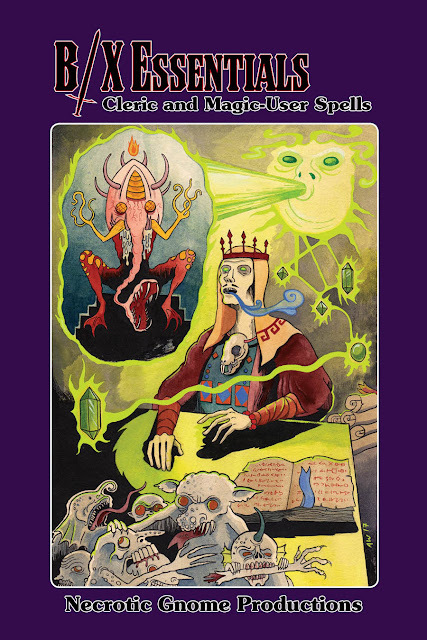 No spells spanning pages (no page flipping while reading a description!). Delightfully illustrated by a bevvy of old-school art-vagabonds. Available as a fully linked PDF or a print/PDF combo (with saddle-stitched option for that "lays flat on the table" goodness). Here ends the player-oriented section of B/X Essentials. The next two books (Monsters and Adventures and Treasures) will complete the game with the referee's rules. B/X Essentials: Cleric and Magic-User Spells: Cover! What can I say? The full, psychedelic majesty of Andrew Walter, unleashed. B/X Essentials: Cleric and Magic-User Spells: Almost Done! The last few illustrations for the book are coming in! Pieces from Kyle Latino and Sean Poppe can be seen in the layout preview above. This is always the most exciting part of a project for me, seeing it finally all coming together. The green squares that I use as image placeholders during layout being replaced with actual artwork. This is going to be a really nice looking book. And a book that I've always wanted myself for use at the table. 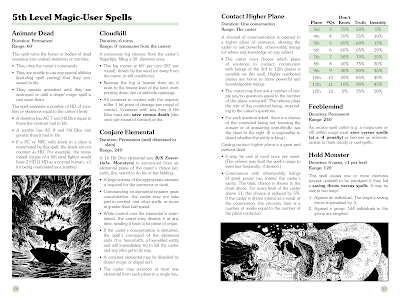 A 34 page, digest-size booklet containing just the B/X cleric and magic-user spells. And loads of artwork. Publication planned for early February. Dolmenwood: Where Can PCs Get What They Want? Following on from my recent world-building article, which posed a series of questions on where different items and services can be acquired in a campaign setting, this post provides answers (or at least hints of answers) to those questions in the Dolmenwood setting. Many of these things will be elaborated upon in future issues of Wormskin or in the in-development Dolmenwood Campaign Book. Hirelings: Castle Brackenwold, Prigwort, and Lankshorn are the most likely places. Torch-bearers / porters: Villagers in any settlement marked on the map may be willing. Mercenaries: Serious military hirelings can only be located in Castle Brackenwold. Sailors: River sailors congregate in Dreg and the docks at Fort Vulgar. Dogs (war / guard / hunting / etc): Castle Brackenwold or Prigwort. Guides: Villagers in any settlement marked on the map may act as guides in their local area. Guides with a wider knowledge of the forest are best found in Prigwort or Castle Brackenwold. Other specialists (assassins, spies, blacksmiths, alchemists, etc): Generally, Castle Brackenwold is the place to look for such people. The most famed alchemist in Dolmenwood is the enigmatic Madame Thornwaif. Engineers and building crew: Castle Brackenwold or larger cities to the south. Gambling dens: The infamous gambling halls of Chateau Shantywood are supposedly the finest in Dolmenwood. Nearby Dreg also has all manner of gambling possibilities. Bars / pubs: Any settlement, but Prigwort is most renowned. Exclusive clubs: One establishment that is open to non-nobles (indeed, anyone who can pay the exorbitant membership fee) is the Sardineers Club, a heavily fortified and ensorcelled pleasure barge that plies the dubious waters of Lake Longmere. Ball rooms: Outside of village barn dances and private functions of the nobility, nothing is really found within Dolmenwood. Bath houses: The fairy bath house of the Hag-Queen Thorn-Rosy is the most fabled location. Otherwise, the Oaf in the Oast, in Prigwort, is popular. Brothels: Chateau Shantywood and Dreg offer all manner of possibilities. Herbs (wolfsbane, garlic): The Man of Gold apothecary in Lankshorn and Wyrmspittle the Herbalist in Prigwort sell all manner of common herbs. 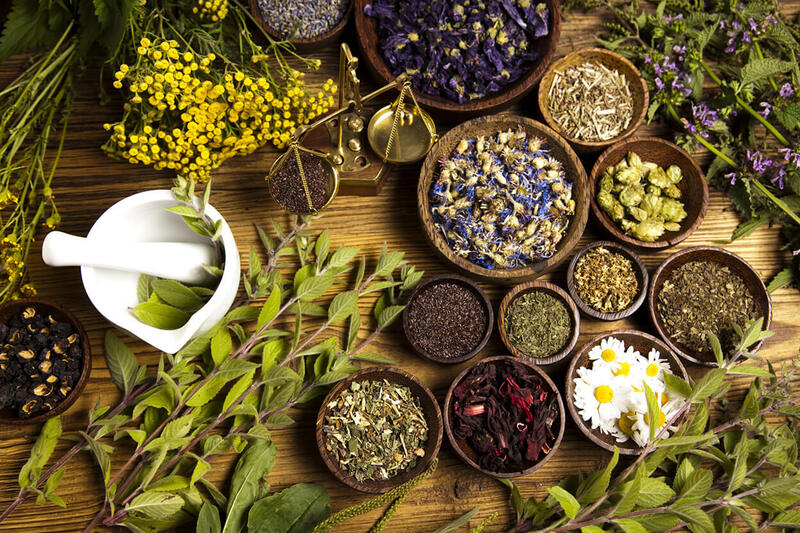 Potions: Both the Man of Gold apothecary in Lankshorn and Wyrmspittle the Herbalist in Prigwort both sell magical healing salves of minor degree. Madame Thornwaif may have such items for sale, if she can be located. Otherwise, consultation with a witch is your best bet. Items that grant bonuses against special attacks (poison, disease, paralysis, energy drain, etc): Both the Man of Gold apothecary in Lankshorn and Wyrmspittle the Herbalist in Prigwort both sell a small selection of such items. Alchemical / lab equipment for magic item creation: Some items could be bought or commissioned in Castle Brackenwold, but much would need to be imported from the south. Enchanted armour or weapons: Truly enchanted items are not commonly for sale. Fancy clothing: Brandybiles, in Prigwort, tailors the most fashionable attire in the region. Gems / jewellery: For high-end pieces, Spathewhat’s, in Castle Brackenwold, is the top choice. The Sea of Stars jeweller’s shop in Prigwort trades in les expensive items, especially unset gems. Customised clothes (sigils, insignias, etc): Brandybiles in Prigwort is the best bet for customised items. Weapons and armour sized for small characters: Armourers in Prigwort and Castle Brackenwold can be commissioned for such work. 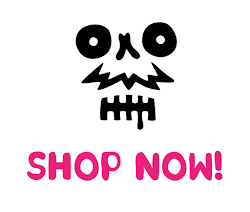 Specialist moss dwarf armour types can only be bought in (or ordered from) Orbswallow. Weapons and armour of exceptional make (that grant bonuses): The bladesmith in Lankshorn is said to craft the finest swords in the region. Customised weapons and armour (engraved, insignias, etc): Blacksmiths in any settlement could take on such work, but the bladesmith in Lankshorn is renowned as the finest choice. Land for sale: The whole forest of Dolmenwood is the property of the Duke. Leaseholds on plots in the vicinity of Prigwort, Odd, Dreg, and Meagre’s Reach can be bought from the Ducal Surveyors’ Guild in Castle Brackenwold. Land in the debated lands to the north of the forest can be acquired on a freehold basis. 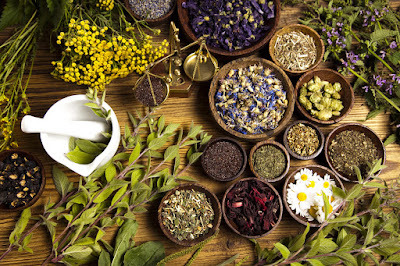 Booze / pipeweed / drugs: Prigwort is top choice for all kinds of alcohol. Pipeweed of average quality can be bought in most taverns throughout the wood (it is all imported from the south). Various psychedelics (including fungi) are sold by peddlers, witches, and (notoriously) the Man of Gold, in Lankshorn. The moss dwarf village of Orbswallow is renowned as producing the finest pipes in the region. Unusual equipment (telescopic poles, repeating crossbows, caltrops, etc): Military suppliers in Castle Brackenwold may be able to order specialist items of this kind. There is no “one stop shop” for this kind of stuff. Alchemical items (smoke bombs, acid, etc): The enigmatic Madame Thornwaif may be able to manufacture such items, if her laboratory deep in the woods can be located. Poisons: Dolmenwood is rife with poisonous fungi, which are sometimes sold on the black market. Wyrmspittle the Herbalist, in Prigwort, sometimes has such items. Witches are another possible source. Warriors: Lord Borrid the Huntmaster (his lodge is in the south-west of the forest). Sir Waverly the Orange (unbested in any jousting tourney; dwells between Castle Brackenwold and Fort Vulgar). Thieves: The Masterful Shydewicke (aka “the Shade”) is without a doubt the most famed thief in Dolmenwood, though his whereabouts is a mystery. The infamous undead highwayman Dewidort of Smerne could also be included in this category. Magic-Users: Mostlemyre of Prigwort (specialist in meta-magic and dweomer-raveling), Merridwyn Scymes (vivimancer), the Lady Ygraine (illusion and fairy magic), Paronax the Enwisened of Blackeswell (dimensionalist). Professor Woglemain of the Royal College of Sorcery office in Castle Brackenwold. The High Priestesses of the witches and the Drune Aegis could also be included here, though they seldom have dealings with those outside of their respective sects. Clerics: The Bishop of Brackenwold is the religious authority in the region. The famed Friar Baldry the Nonchalant wanders the paths of Dolmenwood. The Venerable Laurenne (a living saint) is known to come to Dolmenwood for special quests. Patrons / quest givers: The Bishop of Brackenwold may sponsor expeditions to rediscover or restore lost shrines. Mostlemyre of Prigwort may hire people to gather odd components for magical procedures. If one can get in the good books of a witch, she might pay for psychedelics or other magical components. New spells to learn: Most wizards undertake research on their own; spells are not commonly bought and sold. The wizards mentioned above in teachers/trainers may be open to swapping spells or scrolls. Magic item identification: Mostlemyre of Prigwort offers this service. Deciphering unknown languages: Philontimus the Wizened, resident in Odd, is a sage specialising in dead languages and ancient religion. Lord Malbleat is a recognised authority on foreign tongues. Maps: Overviews of the main roads, settlements, and geographical features can be bought in Castle Brackenwold. Detailed maps of Dolmenwood as a whole are not commonly available. Detailed maps of specific areas exist in libraries (Castle Brackenwold, Harrowmoor Keep). Knowledge about history: The libraries of Harrowmoor Keep are famed repositories of lore, and the Lady Harrowmoor a renowned expert. Philontimus the Wizened, of Odd, is famed for his knowledge of ancient religious practices. How to overcome unusual effects: Consultation with a witch or with Mostlemyre of Prigwort are the best options. Plant / fungus / monster identification: Madame Thornwaif is a renowned expert on the flora and fauna of Dolmenwood, along with their uses in alchemical brewing. The location of her residence is not common knowledge, however. Rumours: Any tavern in any settlement. True names: The Lords and Ladies of Fairy may possess such secrets, but would only betray them to mortals in exchange for outrageous gifts (or in times of extreme need). The Lady Ygraine is said to have the deepest knowledge among mortals of fairy-kind. Get a curse removed: Witches are famed for their powers to curse and uncurse. Resurrection: Is only known in religious mythology. It is not a service that one can buy. Get armour / weapons / other gear repaired: A blacksmith in any settlement can perform basic repairs. Sell valuable items at a good price: Castle Brackenwold and Prigwort are the best places to sell items, due to the number of potential buyers (merchants and/or specialist establishments). Sell highly unusual items: Shadwell and Furrougby Esquire, in Castle Brackenwold (specialist in art, antiquities, and curiosities), is a popular location among treasure hunters. Sell magic items: Selling items is difficult. One of the wizards of renown (see teachers, above) may be interested in specific items. Witches sometimes exchange magic items for services. Sell questionable loot without any questions asked: On a small scale, the taverns of Dreg are likely places to find fences. For larger items, the Thieves’ Guild in Castle Brackenwold is the best bet (if one can find them). Safely store money / treasure: Branches of the Emeraude Bank exist in Prigwort and Castle Brackenwold. For storage in personal property, the services of Greydobe, master locksmith and safesmith (Castle Brackenwold) may be acquired. Money changing: The Emeraude Bank provides this service (see safe money storage, above). Get tattoos: The Roost, in Dreg, is a seedy establishment, but has a talented tattooist. Teleportation: Not a commonly available service, but Mostlemyre of Prigwort would be a good starting point to ask. Magical warding of a building / location: A Guild of Enchanters operates in the region, providing such services. Their guildhouse in Castle Brackenwold can advise on the costs and contractuals. Raise attributes / recover lost attribute points: A witch may be able to heal lost points or provide a charm to temporarily increase attributes. Fairy magic is said to be able to permanently increase one’s natural aptitudes.